94 spacious rooms, 34.5 m2, extra comfortable king and twin beds, feather down bedcover/pillows, full amenities include marble bathroom, separate shower, reading chair, work desk, individually controlled air conditioning, sound-proofing and double glazed windows, cable and satellite TV, Wi-Fi Internet, electronic safe deposit box, radio/alarm clock, coffee and tea making facilities, mini-bar, separate shower and bathtub, bathrobes and slippers, hairdryer. No rollaway. Up to 2 adults and 2 children. 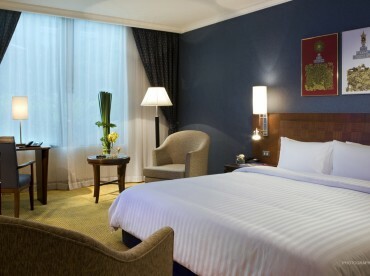 • Reading chair, work area, LCD TV, hairdryer, tea and coffee making facilities and mini bar. • Spacious comfortable, extra comfortable bed, feather down bedcover/pillows, full amenities in marble bathroom with separate shower.